Home / International / product or service reviews / Travel and Living / Why Cochin-Australia is much cheaper than rest of India? Why Cochin-Australia is much cheaper than rest of India? Australia has been on my wishlist for long, but high air fares have been turning me off. It costs half a lakh in air tickets alone per person, hence Australia is currently off my budget. But that doesn’t prevent me from frequently scanning the travel sites for best possible fares. I noticed that Air Asia offers one of the cheapest connectivity to Australian cities-Melbourne, Perth, Sydney etc. AirAsia can take you from India to Australia for just about 11k Rs, if you get the dates right and book well in advance. That is half way across the world for same price you’d pay for a last minute Bangalore-Delhi flight. But the catch with Air Asia is that getting an equally economic return ticket is tricky. While onward fare is 11k, return fares on all practical dates will be about 18-20k, making round trip cost about 32k. That apart, I noticed that ex-Cochin fares to Australia are a lot cheaper than other Indian cities. While AirAsia doesn’t even show connectivity to Australia from BLR or MAA, its rivals like Malaysian Airlines sell Cochin-Melbourne ticket for about 15-20k cheaper than Bangalore Melbourne or Chennai Melbourne. This price difference is substantial and I have been wondering why. So far I don’t have any reasonable explanation. For example, for Departure on 10th Oct and return on 17th October 2014 (COK-MEL), Malaysian Airline economy return ticket fare is about 40k right now, while Jet airways and SQ fares start at around 58k INR. Jet airways fares are similar but SQ is also expensive by 15k. 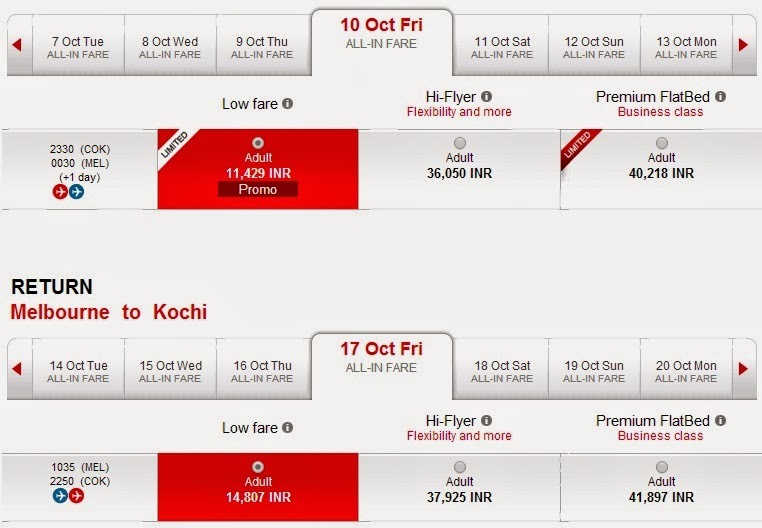 I tried for few other date combinations and ex-cochin rates are always cheaper by 15-20k for most of the airlines. Is the distance between Cochin-Melbourne is less than Bengaluru-Melbourne or Chennai-Melbourne? No. In fact it is further. So there’s no savings in terms of fuel expense or flying time. Does Kerala have huge populations of Australians or does Australia have huge Malayalee population, which might ensure high load factors all the time, thus reduced per seat cost? Does Cochin Airport offer cheap facilities? May be yes, because Cochin airport has much less number of flights per day compared to Bengaluru or Chennai. Thus it should be cheaper to fly in and out of Cochin and per passenger expense on usage of gates, terminals, landing bay etc will be less. But is it so cheap to cause a fare difference of 15-20k? I don’t think so. A difference of one or two thousand is understandable, not 15-20k. Also flying ex-Cochin is cheaper only towards Australia. (I tried for Melbourne and Sydney) When I tried destinations like London, there were no significant price difference compared to other cities. I tried to break up the journey and try figure out which leg is cheaper- Is it COK-KUL or KUL-MEL… Of course Cochin-Kuala Lumpur was cheaper but obviously not to the extent of 15k. So the fare difference is subsidized on both legs. Is it cheaper because airlines are deploying old/outdates planes to Cochin? No idea, doesn't sound to be true. Is aviation fuel cheaper in Cochin? Has it got anything to do with time of flight or connection time? The fare difference is mainly in Malaysian Airlines, Singapore Airlines and Air Asia. Other operators like Emirates, and Jet airways do not have a substantial difference. Then the answer should lie with Kuala Lumpur or Malaysia? Then what is the secret behind 35% cheaper fares to Australia ex-Cochin for Air Asia and Malaysian airlines? Is it just because of competition and peer pressure? Do you have a clue or a guess? Do let me know. This is interesting, Shrinidhi. Thanks for sharing this. I suppose the flights to Cochin is cheaper than elsewhere ...for sentimental reason as the owner Tony Fernandes' mother is of Keralite Malayalee origin.